Profess your love for swimming with fun swim accessories. Some people love swimming so much they want to spread the word to everyone they run into. While it can often be awkward to just start talking about swimming with the people around you, there are other ways to spread the word as well. Express your love for swimming with fun swim accessories you can use in other aspects of your life. When other people see these items, it opens up the door to talk about your favorite topic with them. 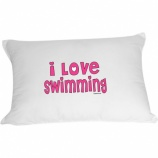 You can find other fun products you can use to profess your love of swimming to everyone around you. From custom t-shirts you can wear everywhere you go to water sports bottles, you will be able to let everyone know you enjoy swimming. To show everyone how serious you are about swimming, you can also choose the swimming magnet that will remind you on a daily basis what a critical part of your life swimming is. You love swimming and you want everyone around you to know it. This is why you can find a wide variety of items that will profess your love of swimming and help you break the ice so you aren’t constantly bringing swimming up to everyone you meet. From window stickers and magnets to pillowcases and t-shirts, you can let everyone you meet know how much swimming means in your life. Everyone loves to be able to show off something special; these products can be just what you need to do the same.